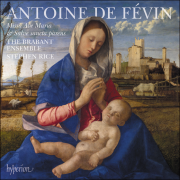 The ensemble’s latest CD with Hyperion Records presents two Mass settings by another under-exposed composer of the early sixteenth century: Antoine de Févin (c.1470-1511/12), who for the last years of his short life was a singer at the royal chapel of France. His Missa Ave Maria is one of the very earliest imitation or ‘parody’ Mass settings, based on Josquin des Prez’s famous sequence motet Ave Maria…virgo serena (available as a free download via the Hyperion website). It is a beautiful piece which shows great sophistication for its early date in reworking Josquin’s model. Missa Salve sancta parens, dating probably from Févin’s younger years, is based on plainchant and shows a facet of his style more akin to composers such as Brumel. The disc also contains two motets: the famous Sancta Trinitas, which is one of the most widely circulated pieces of its time, and which is given in its original four-voice form as well as a later version with two extra voices composed by Arnold von Bruck (?1500-1554). Also for six voices is the joyful Asceniontide motet Ascendens Christus in altum, which like Missa Ave Maria is strikingly modern in sound.